^ Bertulani, Carlos A. Nuclei in the Cosmos. World Scientific. 2013. ISBN 978-981-4417-66-2. ^ 2.0 2.1 The End of the Main Sequence, Gregory Laughlin, Peter Bodenheimer, and Fred C. Adams, The Astrophysical Journal, 482 (June 10, 1997), pp. 420–432. Bibcode: 1997ApJ...482..420L. doi:10.1086/304125. ^ Dina Prialnik. 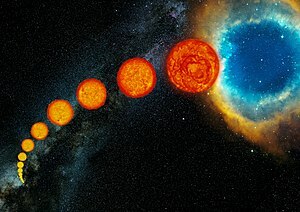 An Introduction to the Theory of Stellar Structure and Evolution. Cambridge University Press. 2000. chapter 10. ISBN 0-521-65065-8. ^ Working Group on Extrasolar Planets: Definition of a "Planet". IAU position statement. 2003-02-28 [2012-05-30]. （原始内容存档于2006-09-16）. ^ Why the Smallest Stars Stay Small. Sky & Telescope. November 1997, (22). ^ Alan C. Edwards. 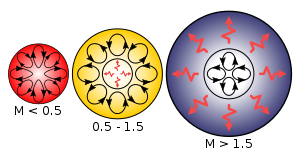 The hydrodynamics of the helium flash. Monthly Notices of the Royal Astronomical Society. 1969, 146: 445–472. Bibcode:1969MNRAS.146..445E. ^ R. G. Gratton, E. Carretta, A. Bragaglia, S. Lucatello, V. D'Orazi. The second and third parameters of the horizontal branch in globular clusters. Astronomy and Astrophysics. 2010-07-01, 517 [2018-04-02]. ISSN 0004-6361. doi:10.1051/0004-6361/200912572 （英语）. ^ I.-Juliana Sackmann, Arnold I. Boothroyd, Kathleen E. Kraemer. Our Sun. III. Present and Future. The Astrophysical Journal. November 1993, 418: 457 [2018-04-02]. ISSN 0004-637X. doi:10.1086/173407 （英语）. ^ D. Vanbeveren; De Loore, C.; Van Rensbergen, W. Massive stars (PDF). The Astronomy and Astrophysics Review. 1998, 9 (1–2): 63–152. Bibcode:1998A&ARv...9...63V. doi:10.1007/s001590050015. （原始内容 (PDF)存档于2009-03-27）. ^ Ken'ichi Nomoto. Evolution of 8–10 solar mass stars toward electron capture supernovae. II – Collapse of an O + Ne + Mg core. Astrophysical Journal. 322. 1987, Part 1: 206–214. Bibcode:1987ApJ...322..206N. doi:10.1086/165716. ^ How do Massive Stars Explode? 互联网档案馆的存檔，存档日期2003-06-27. 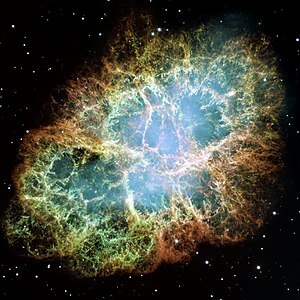 ^ Supernova Simulations Still Defy Explosions. 互联网档案馆的存檔，存档日期2003-08-03. ^ E. P. J. van den Heuvel. X-Ray Binaries and Their Descendants: Binary Radio Pulsars; Evidence for Three Classes of Neutron Stars?. Proceedings of the 5th INTEGRAL Workshop on the INTEGRAL Universe (ESA SP-552). 2004, 552: 185–194. Bibcode:2004inun.conf..185V. arXiv:astro-ph/0407451. 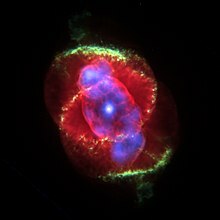 ^ Pair Instability Supernovae and Hypernovae. 互联网档案馆的存檔，存档日期2012-06-08., Nicolay J. Hammer, (2003), accessed May 7, 2007. ^ Ken'ichi Nomoto. Evolution of 8–10 solar mass stars toward electron capture supernovae. I – Formation of electron-degenerate O + Ne + Mg cores. Astrophysical Journal. Part 1. 1984, 277: 791–805. Bibcode:1984ApJ...277..791N. doi:10.1086/161749. ^ Ken'ichi Nomoto and Yoji Kondo. 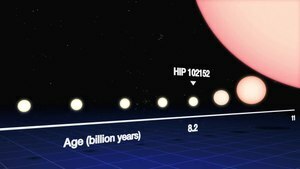 Conditions for accretion-induced collapse of white dwarfs. Astrophysical Journal. 367. 1991, Part 2: L19–L22. Bibcode:1991ApJ...367L..19N. doi:10.1086/185922. ^ D'Amico, N.; Stappers, B. W.; Bailes, M.; Martin, C. E.; Bell, J. F.; Lyne, A. G.; Manchester, R. N. The Parkes Southern Pulsar Survey - III. Timing of long-period pulsars. Monthly Notices of the Royal Astronomical Society. 1998, 297: 28. Bibcode:1998MNRAS.297...28D. doi:10.1046/j.1365-8711.1998.01397.x. ^ Courtland, Rachel. Pulsar Detected by Gamma Waves Only. New Scientist. 17 October 2008 [2014-02-03]. （原始内容存档于2013-04-02）. ^ Demarque, P.; Guenther, D. B.; Li, L. H.; Mazumdar, A.; Straka, C. W. YREC: the Yale rotating stellar evolution code. Astrophysics and Space Science. August 2008, 316 (1–4): 31–41. Bibcode:2008Ap&SS.316...31D. ISBN 9781402094408. arXiv:0710.4003. doi:10.1007/s10509-007-9698-y. ^ Ryan, Seán; Norton, Andrew J. Assigning ages from hydrogen-burning timescales. Stellar Evolution and Nucleosynthesis. Cambridge University Press. 2010: 79. ISBN 0-521-13320-3.